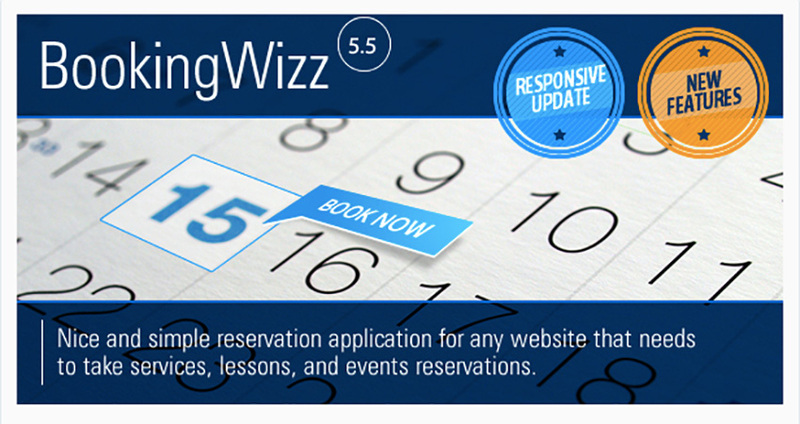 There are several reasons PHP calendar, booking and events scripts may be an indispensable addition to your website. If, for example, you’re a service provider, then it makes sense to have an appointment booking system on your site that allows potential customers to see your availability and select an appointment time and date that is best for them. This could cut down on needless calls to your business to make appointments and free up your time or your staff’s time for other endeavours. With all this in mind, we’ve compiled 15 of our best PHP Calendar, Booking & Events Scripts available at CodeCanyon, to help you choose the one that’s right for you. The Cleanto appointment booking system just entered the market late last year and is already proving to be a solid performer. This appointment booking system is ideal for many different types of service companies looking for a reliable way to provide clients with full-featured online booking. Cleanto - Appointment Booking System is a strong option for business owners looking to provide their clients and customers with a dependable online booking system. 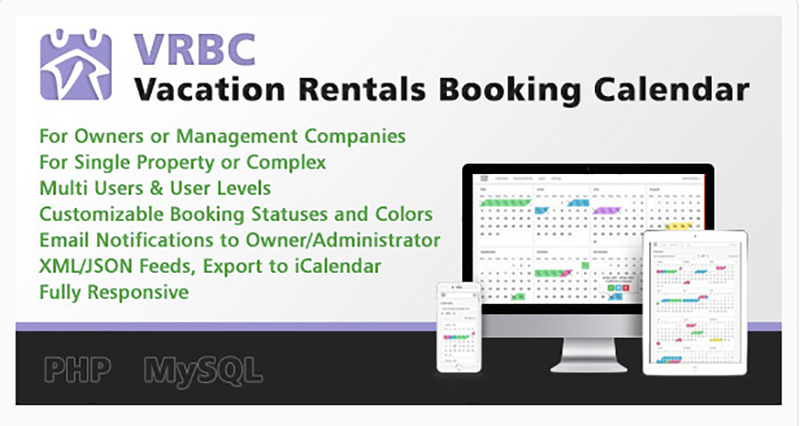 The Booking System script is another appointment booking system that offers four different kinds of calendars to process online bookings for any industry. 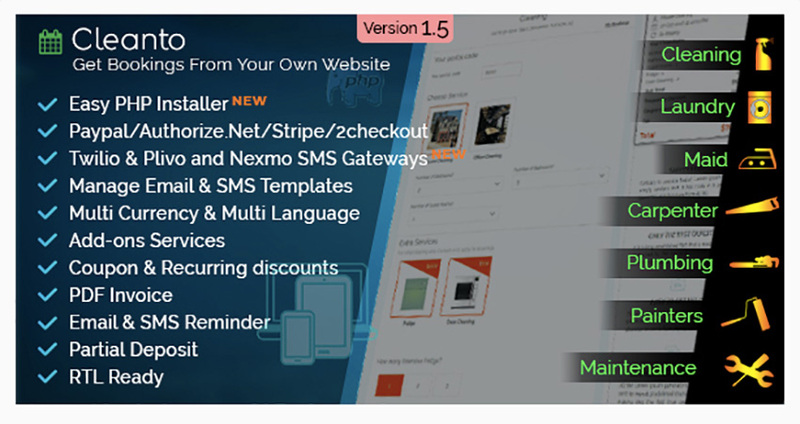 Booking System is one of the top-selling PHP Calendar Scripts on CodeCanyon and a great choice for those looking for a reliable appointment booking system. 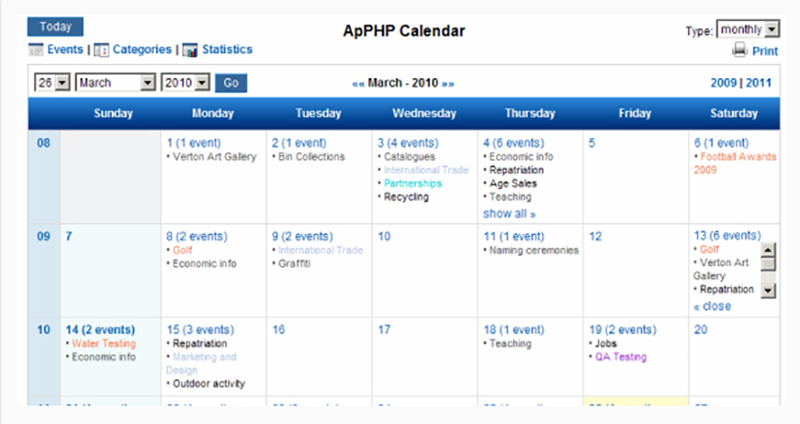 The PHP Events Calendar Control script offers a wide range of features, such as publishing and viewing calendar events and statistical information in a user-friendly design. It can be configured to give access to various types of users. 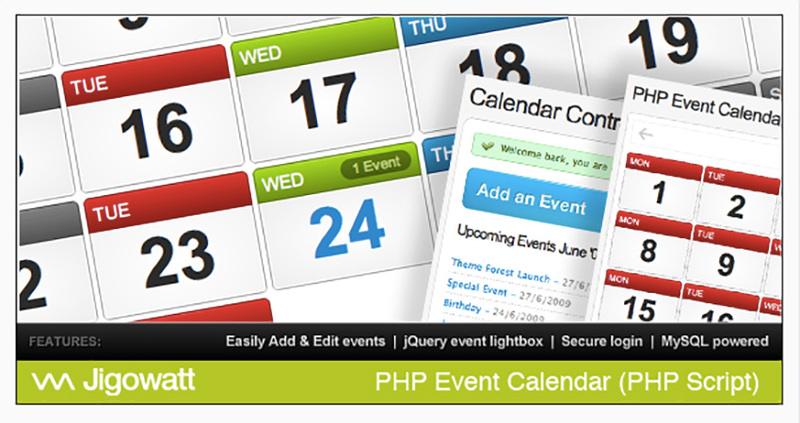 The PHP Events Calendar Control has been around for a while and is a good steady performer. 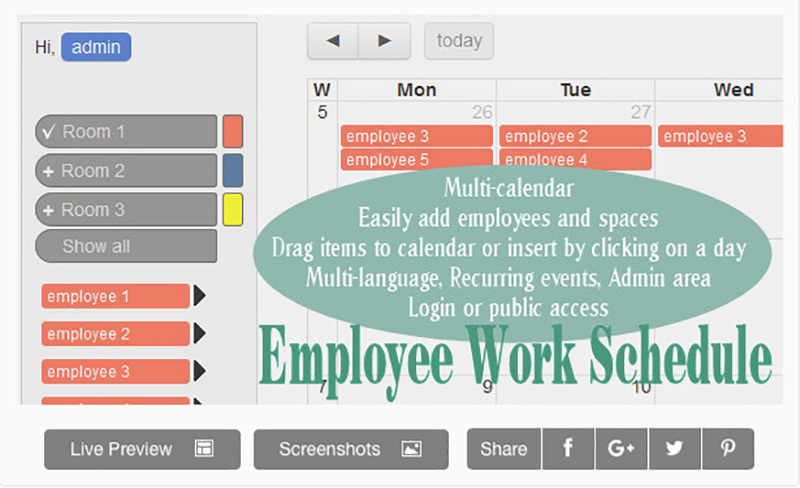 The Employee Work Schedule/Multi-calendar is packed with features that companies will find useful for managing team productivity. The calendar can be set up to provide access to selected team members and allows the designated admin to assign tasks, or conversely team members can record their own self-assigned tasks or appointments. The Employee Work Schedule / Multi-calendar is the ideal choice for small or large companies that need a way for employees to keep each other abreast of tasks and events they’re working on. If you’re a vacation rental property owner or agency, the Vacation Rentals Booking Calendar is a great choice of booking calendar to help you manage your properties. The range of possibility the Events Calendar offers will appeal to a wide cross-section of users. Ajax Full Featured Calendar 2 is a highly customizable personal calendar designed to help you keep organized. This is a bestselling update of another longstanding bestseller, the Ajax Full Featured Calendar. ability to auto-embed YouTube, Vimeo, Dailymotion, SoundCloud, etc. The Ajax Full Featured Calendar 2 is a beautifully simple multi-featured calendar with a lot of appeal. Another CodeCanyon bestseller, the PHP Event Calendar’s primary function is to display events on a calendar on your website. 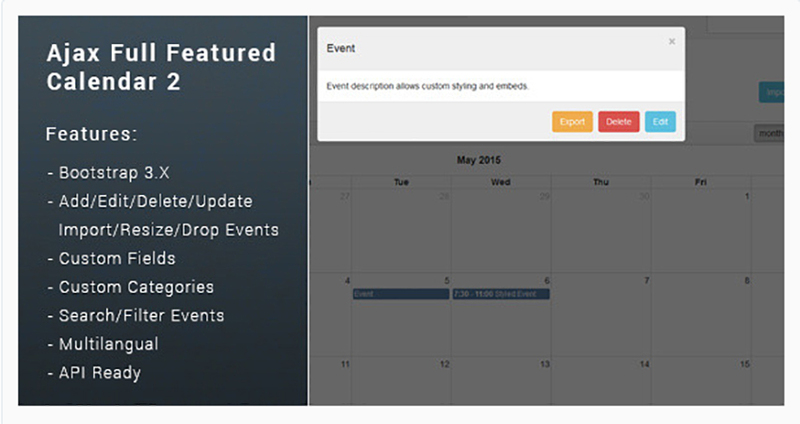 As one of the top selling PHP calendar scripts at CodeCanyon, the PHP Event Calendar is a solid performer that will help you add event details to your website with minimal fuss. The Google, iCal & XML Event List Calendar for PHP is a versatile script that will extract events from your Google Calendar, another iCal stream or just an XML file, and turn them into a comprehensive list of events. The script includes Facebook and Twitter links so you can share the list on your social networks. The Google, iCal & XML Event List Calendar for PHP is a wonderful way to turn the events spread across your calendar into a list view. 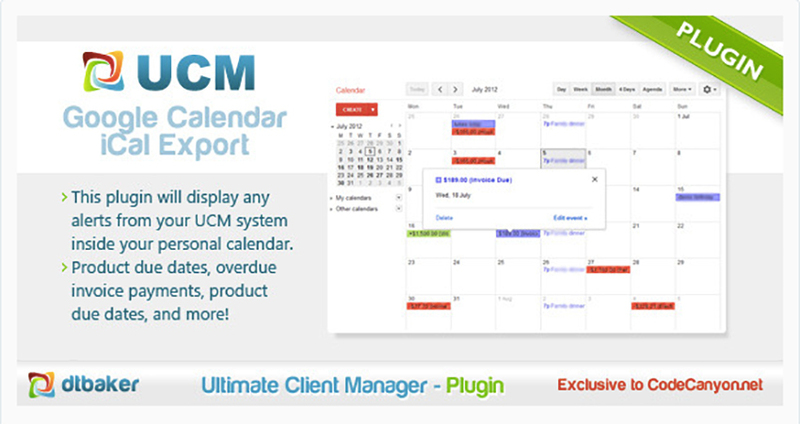 The Freelance Calendar script is designed to complement the Ultimate Client Manager (UCM) system. It will display any alerts and to-do items from the UCM system in your personal calendar. store and search client info, contact details, etc. You don’t have to be a freelancer to benefit from Freelance Calendar—it’s the perfect organizing tool for anyone who uses the UCM system. 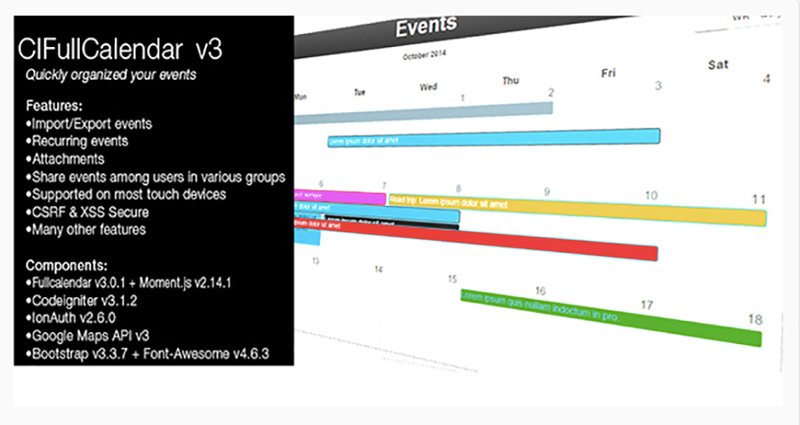 The CIFullCalendar v3 allows users to organize, plan, edit and share calendar events easily by dragging, dropping, resizing, clicking, touching, categorizing, linking, etc. CIFullCalendar v3 is a great choice for businesses or groups who want to collaborate online and stay up-to-date with each other’s schedules. The File Download Calendar is unique among the calendars on this list. 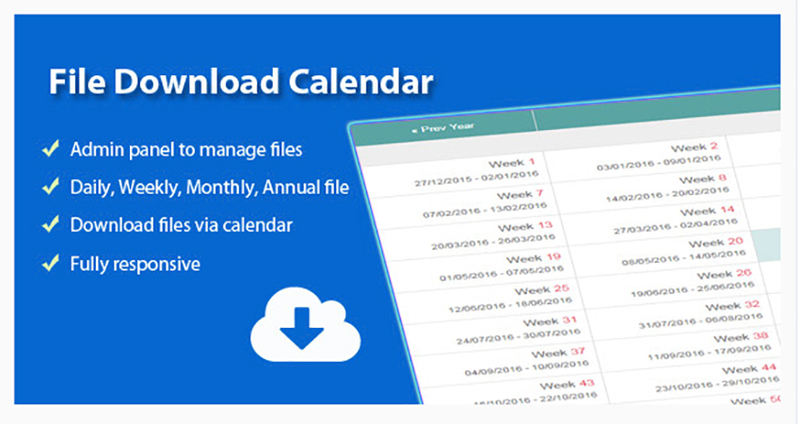 Its function is to create a calendar of files which can be downloaded on a daily, weekly, monthly or annual basis. The File Download Calendar is a simple script that will appeal to those who need the ability to download reports or other files on a predetermined schedule. 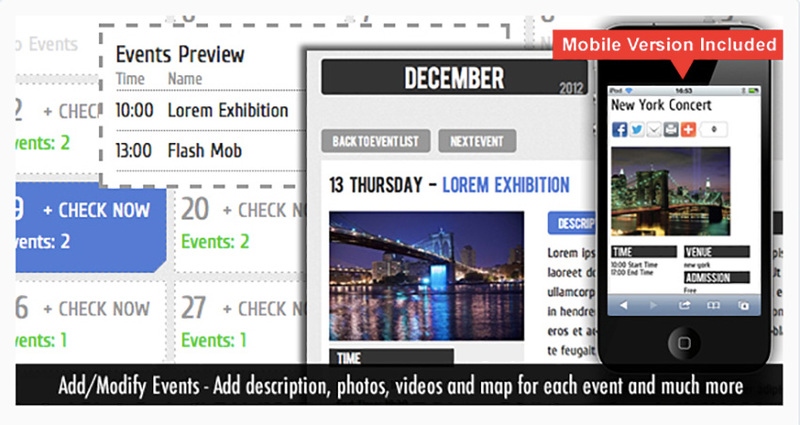 Built with jQuery FullCalendar and integrated onto Bootstrap’s grid layout, the Event Calendar allows users to organize and plan their events. Staying organized and planning events can be a challenge in today’s fast-moving, ever-connected world, but Event Calendar - PHP/MYSQL Plugin will make it easy. With the Facebook Events Calendar For PHP script, you can display all Facebook events on an events calendar in your choice of three layouts: full, compact, or a list view with details of the events. You can put this events calendar everywhere on your website. 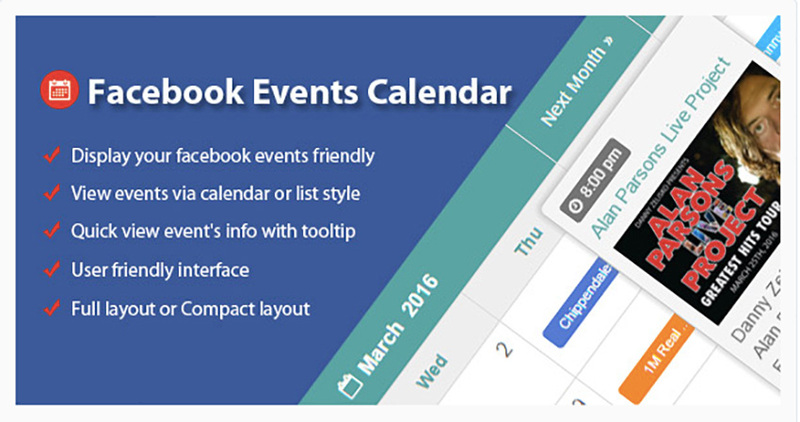 FacebookEvents Calendar For PHP will appeal to a variety of users who want to integrate their calendars with events on Facebook without doing the tedious work of copying and pasting. Quite simply, the eCalendar - Responsive Events Calendar is designed to keep individual users or companies organised with a calendar that allows users to add as many events as needed, as well as details like the event title, location and time, etc. 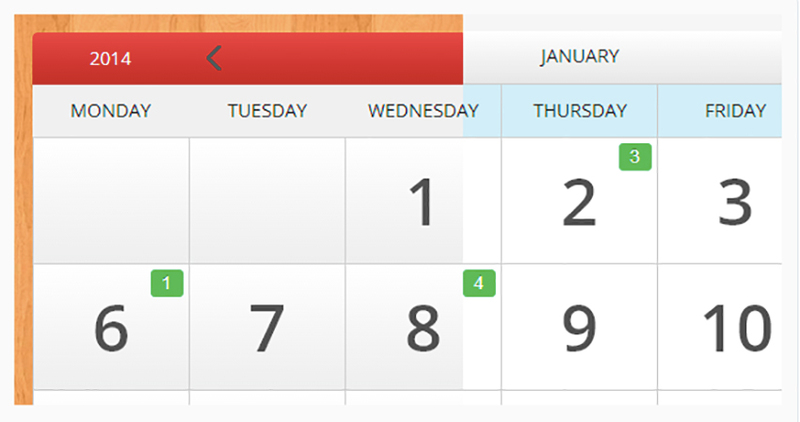 eCalendar - Responsive Events Calendar is simple and very user friendly and will appeal to both individual users and companies alike. These 15 Best PHP Calendar, Booking & Events Scripts just scratch the surface of products available at Envato Market. So if none of them catch your fancy, there are plenty of other great options to hold your interest.